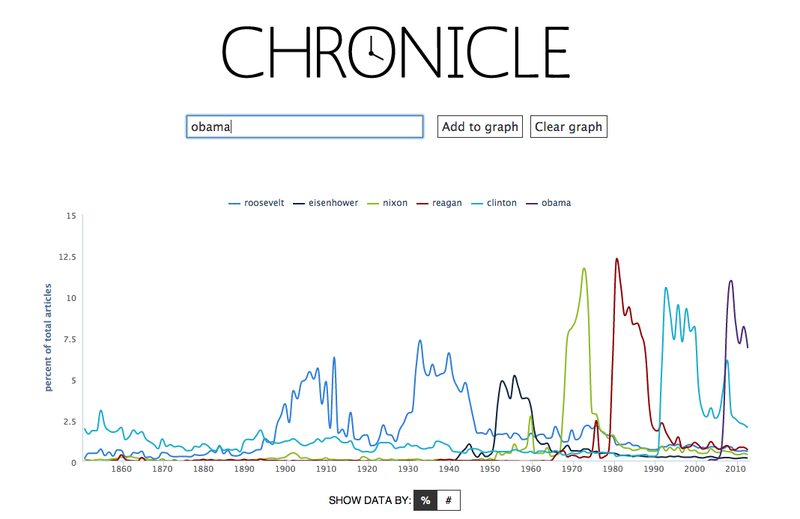 Chronicle is a tool for tracking changes in language usage in New York Times coverage throughout its history. Any word or phrase's frequency of use can be graphed from 1851 to the present, reflecting world events, changing cultural norms, political/social influences, and language styles of different periods. These graphs can then be used as starting points for exploring the Times's rich archive in new ways, allowing users both to find articles that use a particular word or phrase and to examine the changing contexts for those articles through our extensive structured data. Since The New York Times produces more stories per year now than in most of its history, the graph can be viewed in terms of raw article count, or in terms of the percentage of articles each year that contained the search phrase. The articles found to contain the search phrase can be viewed by clicking the graph. The semantic tags that most often appear in those articles are also shown, giving context to the meaning of the phrase in that year and the issues most closely associated with it.